A steel chamber containing a shaft to which rectangular steel hammers are affixed. Replaceable plates lining the mill's interior to reduce wear caused from grinding abrasive materials. Steel screens or bar grates cover the mill's discharge opening. Material is fed in through the top of the mill. Once in the grinding chamber, it is reduced by a combination of repeated hammer blows, particle on particle impact, and contact with the walls of the mill. The material will remain in the grinding chamber until it is reduced to a size that is able to pass through the screen covering the mill's discharge opening. Desired finished particle size - Gravel, granules, powder? Desired production rate - 10 lbs/hr, 10 tph, etc. Hammer mill size - Rotor diameters between 6" and 44", and internal mill widths of 6" to 72". Hammer size and style - Number of hammers, size, style and metallurgy. Screens or bar grates - Style and thickness of screen or bar grates, and size of openings. How will the material be fed into the mill? By hand, auger, or belt conveyor? How will the material be taken from the mill? Heavy materials such as stone or metal may evacuate via gravity, while light or low density materials will require pneumatic suction. Answers to these questions will help to determine the best types of optional equipment such as belt conveyors, augers, rotary feeders, and dust collection, as well as the most efficient design of the infeed and discharge chutes. And that's about it...If you would like more information, please click below to download our free eBook! How Do You Grind Pallets for Recycling? We all have them. Whether you buy, sell, ship or wherehouse, just about any business that handles merchandise in large quantities has pallets. They are the ideal tool for storing and moving myriad materials. But what happens when the pallets become broken, or are just no longer needed? All too often they become a costly waste handling problem. However, if we explore the possibility of recycling, this waste handling problem becomes a saleable product. To achieve the majority of pallet grinding goals, a two-phase process is necessary to make the most valuable output product. Given their dimensions and overall bulk, the ideal method for reducing both whole pallets and pallet scrap is the slow speed ram-fed grinder. The open "deck" design of the ram fed grinder allows for easy infeed of whole or partial pallets whether by hand, or stacked on a fork truck. The hydraulic ram forces the pallets into the grinding rotor which features four-way reversible tool-steel cutting teeth which are hard enough to cut through nails or other ferrous metals. The pallet material is continuously ground until it is able to pass the screen covering the grinder's discharge area. Screen size can vary, and screens may be changed to correspond with production goals. However, it is not recommended that a screen smaller than 1" be used in this application. The smaller the screen, the longer the mill will need to work to produce the required size. Therefore, when processing a bulky product such as pallets or pallet scrap, use of a screen smaller than 1" will dramatically reduce the throughput of the ram fed grinder. So, let's consider how we get to the finish line. For this phase, a finish grinding hammer mill is the best solution. 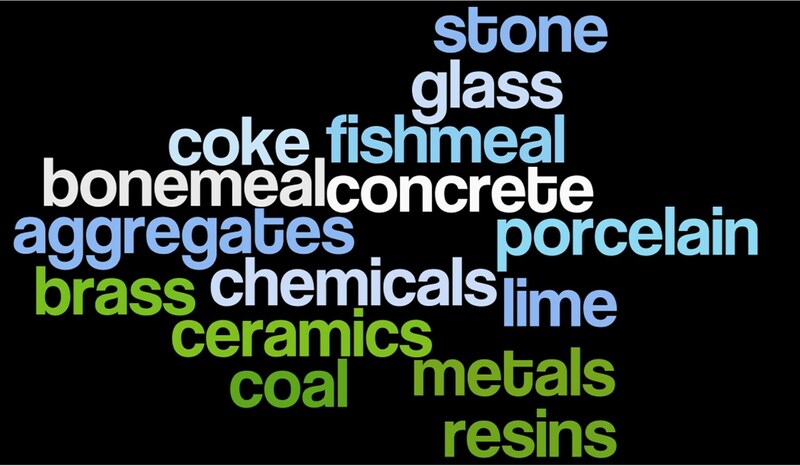 Each of the items shown on the list of suggested end products require a specific finished particle size. The role of a finish grinding hammer mill is to produce the required finished size, anywhere from mulch to sawdust. The pre-ground pallets are fed into the grinding chamber of the hammer mill where a combination of hammer blows, particle on particle contact, and impact with the internal breaker plate work in unison to further reduce the material. The material remains in the grinding chamber until it is able to pass through the screen covering the mill discharge. Screens are available in a variety of sizes, and can be interchanged to correspond with the operator's production goals. If the finish grinding hammer mill is outfitted with an integral fan, the process is taken to the next level. The pneumatic suction pulls the material through the hammer mill, then conveys the finished material to storage. Since the finish grinding hammer mill is producing the finished particle size, the ram fed grinder doesn't need to be concerned with it. As a result, a larger screen (2" to 3") can be used on the ram fed grinder, thus providing less resistance and allowing material to flow through the system at a much higher rate while still liberating all metals from the wood. While the ram fed grinder and the finish grinding hammer mill are the stars of the show, it can't be overstated that the ideal set-up will also include two rotary magnet hump tunnels between the ram fed grinder and the finish grinding hammer mill. Anyone who handles pallets is aware that they contain metal fasteners, typically nails, which hold them together. All metals must be removed if the end product is to be saleable. And, while they are not hazardous to the initial grind, it is critical that all metals be removed prior to infeed into the finish grinding hammer mill to avoid a potentially explosive environment. Got Waste Wood? Convert to Biofuels! Throughout our 80+ year history, wood processing has been one of our cornerstone industries. Among our largest customers are forest products companies, lumber yards, makers and recyclers of pallets, furniture manufacturers, truss plants and more. Each with unique products, but all with one common issue: wood waste. The level of waste varies depending on the industry. An interesting example is forest products companies. When processing logs for lumber, up to 40% of the tree is deemed scrap in terms of its lumber value. Traditionally, these by-products were considered waste, and at best, used as onsite boiler fuel or sold at a minimal profit to local buyers for such uses as landscape mulch and animal bedding. Enter biofuels. Amid growing environmental concerns and the desire to reduce dependence on fossil fuel, the emphasis on biofuel creation continues to increase. As a result, wood has emerged as an ideal feed stock. Now the wood waste once seen as a disposal problem is now a valuable product. But here is the hitch - each of the potential biofuel end products have specific material characteristics that are critical to their effieciency. As a result, there are a number of challenges inherent in using a non-uniform scrap material as biofuel feed stock. In two specific cases, hammer mills are instrumental in taking wood waste from the sawmill floor to the biofuel market. To illustrate this point, let’s use the example of converting wood waste to pellets and briquettes. These are critical factors in the preparation of wood to biofuel feedstock. On average, most biofuels require a consistent feedstock particle size of -1/8”. Typical waste wood as is much larger and non-uniform. The first and most obvious consideration is size reduction. Can hogged wood scrap, bark, pallets, furniture scrap, etc be ground to a size that is appropriate for biofuel production? The answer is of course, yes. The solution lies in selecting the correct wood grinder for your production goals. Answering these questions will determine not only what wood grinder is most suitable for your application, but also whether your goals require a one or two stage grinding process. For example, if your waste material is hogged wood scrap and your goal is a -1/8” for pelletizing, a finish grinding industrial hammer mill would be most appropriate. From there, your production goals determine the size and style of the recommended mill. Conversely, if your waste material is pallets and your goal -1/8” for pelletizing, you will require a two step process. A slow speed ram fed grinder is ideal for the initial grinding of the whole pallets. However, this type of mill is not suitable for the fine grinding required for the optimal finished particle size for pelletizing. A secondary grind in a finish grinding industrial hammer mill will be necessary. Typically, the material will be pneumatically drawn from the ram fed grinder, across magnets to remove all nails, and then though the finish grinder. The upside of this is that this pneumatic component can substantially increase the throughput rate and convey the finished product to storage. Finished particle size of 1/8” will require a screen size of 1/4" or smaller. The material will remain in the grinding chamber of the hammer mill until it is reduced to a size that will pass through the screen. The majority of biofuel applications require a moisture content of ≤10%. However, it is not uncommon for waste wood, such as bark or green wood chips, to have ≥50% moisture content. Not only is the moisture content too high for fuel efficiency, it is also too high for a wood grinder to reduce the wood to a uniform particle size suitable for pelletizing. Under these circumstances, the solution is often a three phase process where hammer mills play a pivotal role. The following is an example of how one of our customers addressed this challenge. Their goal was to convert wood waste with an average 40 to 50% moisture content to suitable feed stock for pelletizing and briquetting. An industrial wood grinder was used to pre-grind the green wood down to a uniform ½” particle size recommended for optimal drying in the rotary drier. The drier would reduce the moisture content down to the required ≤10%. Finally, the material is fed into a second industrial wood grinder where it is ground to its finished particle size, ideal for the customer’s pellet and briquette production. Whether it is space constraints or small production, a laboratory scale hammer mill is often the right choice for size reduction. 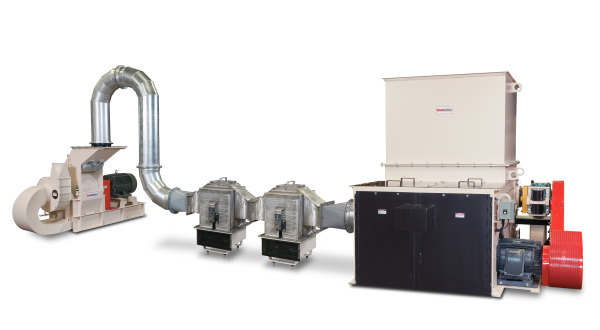 Often used for testing and batch sampling, common installations include: colleges and universities, government testing facilities, and pilot plants. 1. 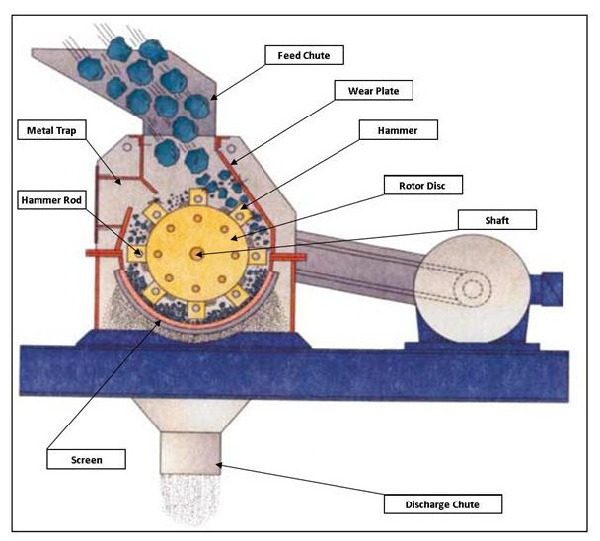 Can my material be processed in a lab scale hammer mill? The laboratory scale hammer mill has the same full range of capabilities as larger industrial hammer mills. Applications include: chemicals, glass, food waste, biomass, lathe turnings, metal powders and much more. Material infeed size and production goals are the ultimate determining factors on whether or not a lab scale hammer mill is suitable for your operation. 2. How durable is the lab scale hammer mill? The lab scale mills are constructed based on customer specification. The options include carbon steel and 304 or 316 stainless steel. Stainless steel models feature all stainless steel contact surfaces. Replaceable internal liner plates are also an option, The liner plates protect the grinding chamber from wear that results from processing abrasive materials. 3. Can a lab scale hammer mill produce multiple particle sizes? Yes. In an earlier post we discussed the factors determining particle size. In short: the screen size, shaft speed and hammer configuration selected give you the ability to steer the particle size in any direction you require. This principle holds true with the lab scale hammer mill as well. Hammer configuration is determined by the material and processing goals, and is generally not changed once mill construction is complete. However, shaft speed and screen size are quite flexible. Screens can be purchased in multiple sizes and are easily interchanged. The smaller the opendings in the screen, the finer the product that is produced. An optional Variable Frequency Drive (VFD) control allows the operator the ability to control the rotor speed. Faster rotor speed results in harder and more frequent blows, where as a slower speed allows for a tighter particle size distribution. 4. Is the lab scale hammer mill scalable? Absolutely. The lab scale hammer mill is, quite simply a miniature version of larger production models. Thus, the lab scale hammer mill production results can be extrapolated to that of its larger counterparts. 5. What can I expect in terms of set-up and maintenance? The lab scale hammer mill is fully assembled upon delivery. The operator simply needs to connect the mill's motor or control panel to the main building power source. The top of the hammer mill hinges open to allow easy access for cleaning, screen changes and hammer rotation. As with larger hammer mills, optional dust collection systems can be integrated if needed. New Friend: Paper! You’re that paper company, right? Me: Well, no. Actually, we manufacture size reduction machinery, such as hammer mills. Me: You know that cinnamon you sprinkled on your toast this morning? Me : It was made in a hammer mill! 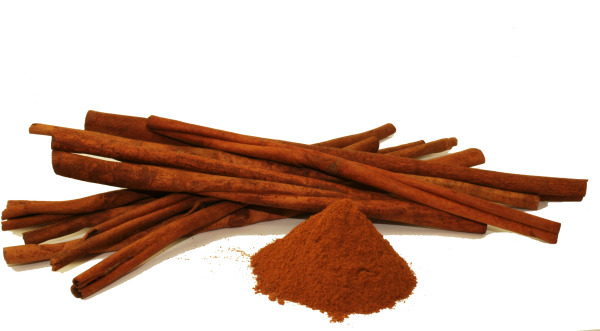 The dried, curled cinnamon bark “sticks” are ground in a hammer mill to make the fine powder that you are familiar with. The simplicity of the hammer mill makes it very adaptable to the varying characteristics of different spices. 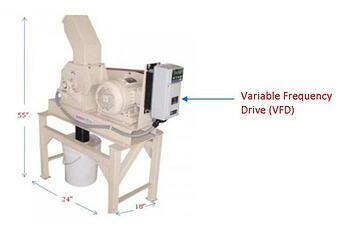 It is this versatility that makes the hammer mill the ideal choice for those processing more than one variety. Because the processing mechanism results in crushing by impact instead of compression, spices are ground to the exact desired particle size without significant heat increase that could cause loss of flavor or aroma. The importance of exact finished particle size cannot be overstated when grinding spices. The key component to a hammer mill processing the exact particle size is the perforated screen covering the mill’s discharge opening. Screen selection allows the processor to determine the largest allowable finished particle size. Material remains in the mill’s grinding chamber and continues to be pulverized until it is able to pass through the screen. Screens of varying sizes can be used interchangeably in the same mill. A 1/8” perforated screen will produce a coarser tea cut finished size. Whereas a 1/32” screen will produce a fine powder. 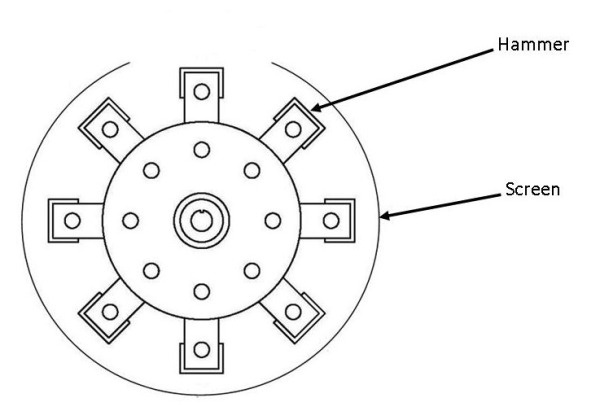 The second component of particle size determination is the rotor speed. As the rotor spins, the hammers impact the material in the grinding chamber with great severity. In addition, very hard materials such as cloves, ginger and turmeric will require a higher rotor speed to produce the same finished particle size as softer materials like white and black pepper. An optional variable frequency drive electrical control allows the operator to easily speed up or slow the rotor speed as needed for different applications. Finally, what size and style of hammer mill is best? This is determined by infeed material characteristics and desired throughput rate. For softer, easier to process materials, a hammer mill with a nearly full circle screen is most suitable. The 300 degree screen coverage allows for the greatest throughput at the lowest horsepower. Fibrous herbs, and roots such as kava, cassava, yam, carrot and ginseng are best ground in a more traditional industrial hammer mill. 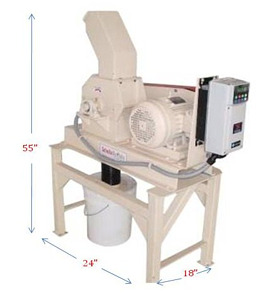 This style of hammer mill contains an internal ribbed breaker plate which is the first point of contact when material enters the grinding chamber. Given its ribbed construction, the breaker plate has a wash-board effect, breaking, down the material, thus making the pulverizing action of the hammers more efficient while reducing wear on the screens. Both the circular screen and industrial hammer mill models range in size from pilot scale to high production models. The size of the mill and the recommended horsepower of the motor is dependent on the processor’s throughput goals. If you were looking for the latest magic bullet for trimming your waistline (and aren't we all?) unfortunately, Google has lead you astray. Material size reduction is our topic of discussion today. There are many terms that fall under this umbrella: crush, grind, pulverize, shred, de-lump, de-fiberize, just to name a few. Likewise, there is a whole host of machinery styles that accomplish these goals: hammer mills, grinders, shredders, lumpbreakers, impactors, jaw crushers and more. Material is fed into the mill, typically by gravity. Inside the grinding chamber, the material is repeatedly struck by flailing ganged hammers which are attached to a shaft that rotates at a specified speed. The material is crushed by a combination of hammer blows, collision with the walls of the grinding chamber and particle on particle impacts. Perforated metal screens or bar grates cover the discharge opening of the mill retain the coarse material for further processing while allowing properly sized material to pass through. Hard, heavy material such as stone, glass or metal can exit the mill via gravity. Lighter or low density materials such as wood and paper require pneumatic suction for effective discharge. Well, that would be too easy, wouldn't it? Finished particle size is determined by a combination of the following: screen (or bar grate) size, shaft speed and hammer configuration. For example, a fast shaft speed, small screen and large number of hammers typically produces a fine end product. Conversely, a larger screen, fewer hammers and slower shaft speed will result in a coarse product. Disclaimer alert: It is important to know that this is a very simplistic explanation of a very complex engineering process. Each of these factors is determined based on careful consideration of the the material being processed and the user's production goals. Each of the key components: screen size, shaft speed and hammer configuration can be changed individually or in combination to achieve the precise finished particle size at the desired production rate. Crush, grind, pulverize, shred... Size reduction is fascinating! Yeah. It is a mouthful. Frequently misspelled and often mispronounced, but our verbose trade name has an interesting origin. Back in the late 1920s two size reduction equipment manufacturing companies emerged in Buffalo, NY; each with their own distinct focus. Schutte (pronounced shoot-ee) Pulverizer Company focused on processing organic materials, building an extensive line of gravity and pneumatic discharge hammer mills, earning them a leadership role in the fields of wood waste reduction and feed and grain processing. Across town, Buffalo Hammermill Corporation was applying similar principles to more industrial applications such as mining, metals recycling and dry chemical processing. Fast forward to 2001 and the two companies have merged. The result was Schutte-Buffalo Hammermill, but bigger changes were still ahead. In 2004, company President Tom Warne and General Manager Jim Guarino joined forces to purchase the company from retiring owner, Harry D. Schutte. Post merger and now post acquisition, the new incarnation of Schutte-Buffalo Hammermill is still a company small in size, but one with an ever growing impact. Even today the staff numbers just under 30, and 90% of the equipment fabrication takes place in "The Shop" adjacent to our corporate headquarters here in Buffalo. However, we have seen tremendous growth in recent years. Presently, our installations number more than 16,000 worldwide, serving a wider variety of industries and applications than any other size reduction machinery manufacturer. A key component in this growth and the overriding theme of the Warne / Guarino era has been innovation. Building on the success of Schutte-Pulverizer Co. and Buffalo Hammermill Corp, the time proven principles of size reduction technology and manufacturing have been applied to new and burgeoning applications. Industrial hammer mill technology originally used to process coal and bulk chemicals has been adapted to de-manufacturing electronics for recycling, and for dismantling spent military munitions. Similarly, machinery developed for processing wood for mulch production or animal bedding has been applied to processing wood for a myriad of bio-fuel applications. Applications: from the commonplace to the very, um.. unique materials processed in hammer mills. A comparison of the different types of size reduction equipment and their uses.